Sure, looking back can be fun. 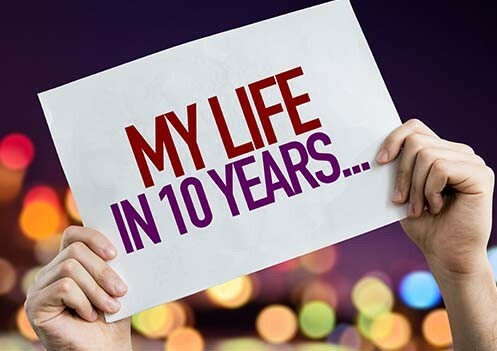 If you are here 10 years later you have everything to celebrate, no matter how many earned wrinkles, pounds or gray hairs you may have accumulated. I have a different sort of 10-year challenge: What do you want financially by 2029? You can do nothing about the past, but the future is yours to shape. So, what’s it going to be? I challenge you to write down two to three financial goals. Is there something you want to stop doing? What don’t you have today that you want to have in the future? Write it down. When we commit to something in writing it tends to make it more “real” for us. And I want you to make your list in the form of a mantra of sorts that imagines you have achieved your goal. You are to make a declaration that has you triumphant. I am young, powerful, and successful, and I make at least $10,000 a month. I wasn’t yet powerful or successful. And $10,000 a month? Please. I didn’t make that in a year! But I wrote this down, and every day I re-wrote it at least 20 times, and I said it out loud to myself 20 times, while staring in a mirror. It was such a part of my every-day existence that it made it easier—and exciting -- to stay focused on doing the work and making the choices that would make my mantra a reality. And notice that I said I was making at least $10,000 a month. At least. The biggest vote of confidence in yourself is to not limit yourself by setting ceilings. So, that brings me back to my financial challenge for you: where do you want to be in 10 years? Don’t make it a long list. Focus on just a few achievements that would make you feel secure. And happy. When you keep it to a short list you can then dig into the next step: Taking steps to reach your goal. Write down your plan for what you will do this week to work toward your goal. Yep, think in weekly chunks. That keeps you focused and when you can nail a goal over seven days it can help you build momentum to carry you through the next seven days. At the end of the week, assess how you did and set your goal for the following week. I encourage you to do this with someone else. A partner, a bestie, a colleague who you know would love to hold you accountable (and vice versa). Or make it a group activity. Trying to do this on your own makes it harder than it needs to be. Opening yourself to support and guidance, and the occasional kick-in-the-pants from people who know you, and care about you, can keep you on track. The financial life you want for yourself, and for your loved ones, 10 years from now is not just a dream. It can be your reality if you start working on it today.